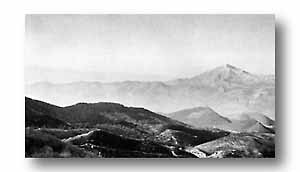 Throughout another long month the 36th encountered difficult, uphill fighting in the mountain masses north of Cassino. The enemy, his defensive positions anchored solidly in the hills as well as covering the valley approaches, resisted vigorously any offensive movement on our part. The weather, too, reached its coldest peak during February. Noncombat casualties exceeded those of battle. During the night of January 25, the 142nd Infantry, after being in reserve for the Rapido operation, was hurriedly switched to the San Elia sector north of Cassino. Here the French, after sweeping across rugged mountain country to the right of the Division and down into the San Elia Valley, had succeeded in making a limited crossing of the upper Rapido four miles north of Cassino. The mission of the 142nd was to widen this salient and bridgehead. At the same time elements of the 34th Division had gained a hold on a small knoll above the village of Cairo on the other side of the fordable part of the Rapido. Enemy artillery enclosed this salient with devastating effect. From magnificent vantage points on Mt. Cairo and its lower slopes, and from white-topped heights on all sides the Germans watched our every movement and followed through with fire. The three battalions accomplished on successive nights the crossing of the Rapido at San Elia to reach assembly positions on the far side, after the first attempt by the 3rd Battalion was turned back by the intensity of enemy fire. The 3rd Battalion Commander, Major Rush S. Wells, was killed at the outset of the attack. Then the 2nd Battalion lashed out in an attack toward Terelle, a mountain town at the end of a single road winding up from the town of Cairo. German defenses were overrun in the uphill drive and an enemy aid station captured in its entirety before the advance was halted short of Terelle. Here a change in direction had been ordered. The 1st and 3rd Battalions then moved laterally across the slopes of Mt. Cairo, parallel to the main German defense line, preparatory to attacking Mt. Castellone. En route the troops learned that another unit had occupied the hill from the east without resistance. On orders to continue, the 142nd battalions moved up to take over and establish the defense of Mt. Castellone. Fresh optimism flared as a result of these real gains. DIAGRAM TO EXPLAIN PHOTO ABOVE, SHOWING TERRAIN THAT FIGURED IN BATTLE FOR CASSINO AND LIRI VALLEY.